This website is for new and existing members of the Angel Business Club. It has been created as resource to help members understand more about the Club. The more you understand the Club, the greater your chance of making even bigger profit. If you have a FREE account only, watch this video to see why you should upgrade your account as soon as you can. One of the big benefits of joining The Angel Business Club are the share allocations which are issued to members for free every month. 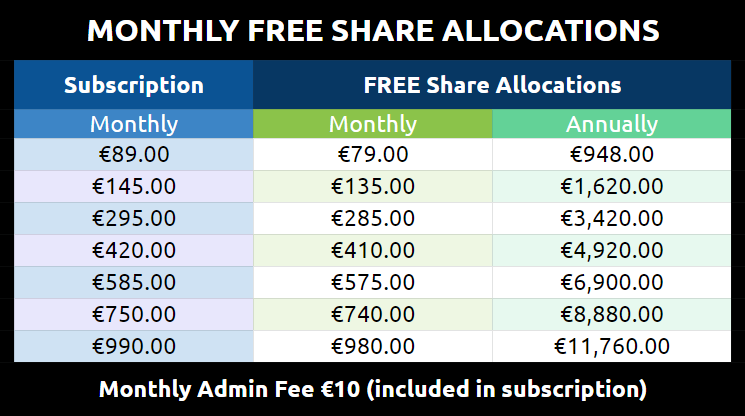 Each member pays a monthly subscription for access to the Club facilities and in return receives shares to the same value, minus a small €10 (c. £9, $11 USD) admin fee. This effectively means the actual "cost" to be a member is just €10/month. A lot of members just treat their subscription to the Club like a savings plan, on steroids.